Your business has a defining point that makes it unique over any other business out there: take advantage of that and make the most of distinctive point with the help of a specially made, tailored chatbot. No matter how big or small your business is, it can surely use a constantly growing mascot that defines its outward image and spreads a business’s support system in a much more innovative and fun way. Numerous businesses so far have joined the chatbot scene and came up with novel ways to expand their businesses’ reach and boost their sales as well as their conversion rates. Chatbots have proven to be a versatile means of technology that can be customized to suit any given industry. 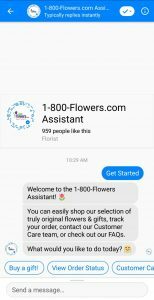 The flower delivery service launched its chatbot GWYN in 2016, with the first quarter of 2017 showing a notable 6.3 percent to $165.8 million in revenue. The business as a whole had a 1.8% increase in revenue in 2017 to that from the year before a $1.19 billion compared to the $1.17 of the year before. The company was able to attract 918,000 new customers for the last quarter of 2017, but a total of 3.6 million customers throughout the entire year. 7 million placed orders, with a 48.3% becoming repeat customers. The chatbot’s integration had played a good role in that and helping the company’s eCommerce business improve. Amtrak’s transportation company is one of the most to benefit from its chatbot, Julie. The company witnessed a 25% increase of booking, a 50% growth in customer engagement, 30% in online booking and managed to save $1 million dollars on customer service, with an 800% return on investments. Making for a very great move on Amtrak’s part and great use of chatbots. The international clothing enterprise has had an increase in sales up from the fall of 2016. There seems to be a lot of factors that have contributed to that increase, but the ease of use and inquiry with the launch of its chatbot could only have helped. 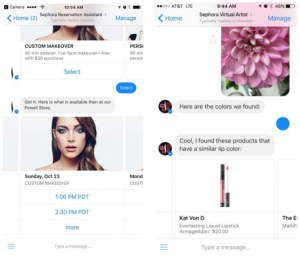 Sephora’s one of the businesses that managed to exploit chatbots quite well, it tackled two areas of customer care. There’s Sephora’s Virtual Assistant and Sephora’s Reservation Assistant bot, which is said to have increased the conversion rate by 11%, helping users visually consider particular products and shades, as well as make appointments. Madi the bot can analyze photos sent to it and give recommendations for hair colors that would suit the sender best. It saves up to 2.5 million “hair profiles” so that with the help of particular data and inquiries can find the perfect fit.The best thing about Madi is that it uses the previously accumulated images to figure out the best results, with an accuracy rate of around 85 percent, according to Madison Reed. Expensify is a software that helps companies control their expenses. The chatbot Concierge helped simplifying Expensify’s setup and would help solve minor issues, answer inquiries and notify users of new things. It’s said to have helped reduce 75% of the banking problems people have, as well as multiplied the software’s subscribers for the trial version. 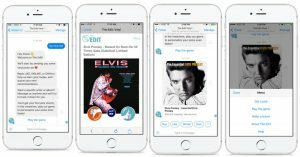 The online Vinyl store was able to reach a high level of sales of $1 million dollars in 8 months with the help of its chatbot, that would intrigue its customers into purchasing records via daily recommendations. WeChat is one of the first companies to have a chatbot platform, starting as early as 2013. Chinese people can do basically anything on WeChat, to the extent that it’s become a necessity for entrepreneurs to be on WeChat before even making a website, for people are more likely to search out things via WeChat than any other source. It has over 1.1 billion accounts and over 750 million daily visits. Which provides a great place for Wyre the chatbot, mostly directed to large business owners. Baby Center is focused on publishing articles to help parents-to-be out. After the messenger app came out, it helped in increasing the read rate by 84% and the click-through rate to the website by 53%. FirstJob is an online recruitment firm helping fresh graduates find entry-level jobs. Mya has had a great hand in accomplishing more work in less time, engaging users and going through the candidate pool to leave the important jobs, like the interviews, to the actual recruiters of the firm, saving a lot of time. 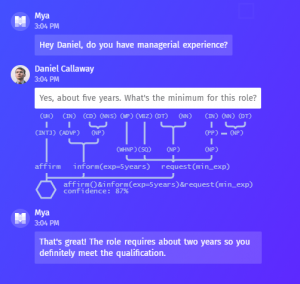 FirstJob claims that there was 79% decrease in the time to hire when a recruiter works, 90% of candidates re-engage with Mya in app or over SMS, 75% of the qualifying and engagement process. According to Forbes’s studies, the Mya platform has improved recruiter efficiency by 38% and candidate engagement by 150%.